33rd Annual Whitesbog Blueberry Festival - June 25 and 26, 2016 ~ The History Girl! 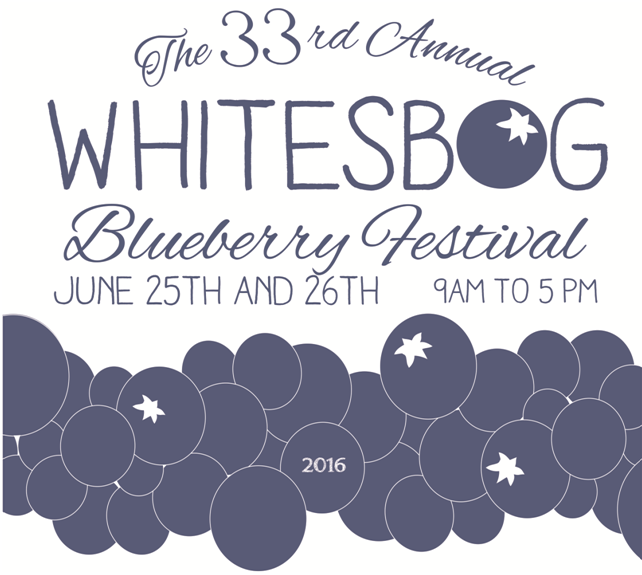 The 33rd Annual Whitesbog Blueberry Festival is just around the corner - Saturday and Sunday, June 25th and 26th, 2016 from 9:00 am - 5:00 pm at Historic Whitesbog Village. This annual celebration of all things blueberry – the official state fruit of New Jersey – is considered to be one of the finest “old-fashioned” festivals in the tri-state region. The Festival features the pioneering work of Whitesbog’s own Elizabeth C. White to domesticate the very first blueberry, traditional Pinelands musicians, artists and crafters, fantastic festival food, wagon tours, lectures, demonstrations and dozens of children’s activities will all be featured at the day-long festival. But the real star of the show is, of course, the blueberries! This year, we are celebrating the Centennial of the Blueberry, by commemorating the unique partnership between Elizabeth C. White and the USDA’s, Dr. Fredrick V. Coville, which resulted in the cultivation of the very first domesticated blueberry. The 33rd Annual Blueberry Festival will feature this extraordinary partnership, recognize the Pine Barrens’ woodsmen who helped Elizabeth White to identify and collect the region’s biggest and best wild blueberries, and ultimately, made her pioneering work possible. A special arts project will feature the traditional Pinelands crafts that helped to fuel the Pine Barrens’ economy during the same period. These featured exhibits and demonstrations will include basket making, woodworking, weaving and other notable ‘Pine Barrens’ crafts. Top attractions at the day-long festival include fifty of the Pinelands best crafters and artists featuring fine art and photography, Pinelands Antique Engine Association’s displays of tractors and farm tools, living history tours, and interactive experiences festival goers can enjoy throughout the day. For the children, activities such as the outrageously fun blueberry pie-eating contest, a hunt for the Jersey Devil, face painting, hands-on crafts, traditional games, and a dress up photo booth will keep the young ones entertained all day. Live bluegrass, country, folk, celtic, and Americana music by the Basement Musicians, the Bad Dogz, Clan Suibhne, Elaine & The Cimmarron Sky Band, Warm Hearted Country, Jet Weston & The Atomic Ranch Hands, The Woodshop Band, Piney Hollow Drifters, Yankee Rebels, Greenwood Circle, Bill Doerge & Bob Wright, and the Accidental Jug Band provide the perfect atmosphere for the festival, which the Burlington County Times has described as “a reminder that good old country life is alive and well” in the region. The Pinelands, New Jersey’s blueberry and cranberry industries and our region’s rich history intersect in delicious ways in this corner of the state. History buffs can explore Whitesbog’s agricultural museum, tours Suningive, the home of Elizabeth Coleman White, visit the restored Cranberry Research Substation and tour a cottage that depicts what life was like for Whitesbog’s workers in the 1920s, view the newly restored Whitesbog Gallery’s All Things Blueberry Show and shop in Whitesbog’s authentic General Store. Fresh fruit enthusiasts will delight in local blueberries and blueberry baked goods at the celebration. Whitesbog is home to the world’s oldest test fields for domesticated blueberries, which will be open at the Blueberry Festival to give people an opportunity to experience firsthand a bit of our State’s agricultural history. Historic Whitesbog Village, is located at 120 N. Whites Bogs Road, Browns Mills, New Jersey 08015. Parking is $10.00 per car. $5 per person arriving by foot or bus. All proceeds benefit the Whitesbog Preservation Trust in their continuing efforts share Historic Whitesbog Village and the surrounding Pinelands with the public. Parking is set on the Whitesbog airstrip – a 2-minute drive from the festival grounds. Shuttle buses bring visitors from this remote parking area to the village throughout the day. 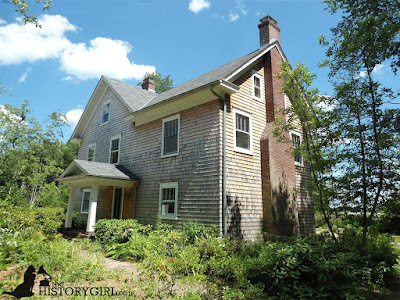 Suningive, the home of Elizabeth Coleman White will be open for tours. The Annual Blueberry Festival’s funding is made possible in part by the New Jersey State Council on the Arts/ Department of State, a Partner Agency of the National Endowment for the Arts through a grant to the Burlington County Board of Chosen Freeholders. This important grant supports a special Centennial Art Project and pays musicians’ fees. The Whitesbog Preservation Trust is proud to receive this special project grant from the Burlington County Board of Chosen Freeholders. The Whitesbog Preservation Trust also thanks the New Jersey Historical Commission for their general operating support of our operations and special projects, and the many sponsors that make the annual Blueberry Festival possible. Every year the generosity of our sponsors: the Pine Island Cranberry Company, Joseph J. White, Inc., Beneficial Bank, Deborah Heart and Lung Center, J W Jenkins & Sons Well Drilling, Impact Remodeling LLC, White Dotte Dairy Bar & Grill, Renewal by Anderson, Scenic New Jersey, Marketing Gurus, LLC, Central Jersey Equipment, Five Star Home Foods Inc., Geoscape Solar, Red Lion Diner, Fall Creek Farm and Nursery Inc., New Jersey Conservation Foundation, DiMeglio Septic, Inc., Dave and Terri Chiddenton, John and Rosanne Bornholdt, and many others, ensures the success of the Blueberry Festival and the continued restoration of an important piece of New Jersey history. All festival proceeds benefit the Whitesbog Preservation Trust’s on-going efforts to restore, protect and interpret Historic Whitesbog Village. Whitesbog is part of Brendan T. Byrne State Forest, administered by the State of New Jersey, Department of Environmental Protection, Division of Parks and Forestry.